Delta, a pioneer in display and monitoring technology and a global leader in thermal and power management solutions, announced high-end eight metre-wide rearprojection DLP® video wall solution, which has greatly improved the execution performance and efficiency of Bangalore Metro Rail Corporation Ltd (BMRCL)’s Operations Control Centre (OCC). 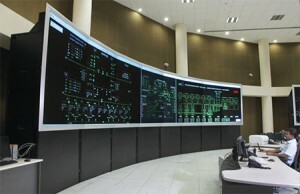 This innovative solution, which integrates both state-of-the-art display hardware and vision controller software developed by Delta, monitors the electrical grid powering the metro trains that run on the Bangalore Metro and guarantees a seamless display on the video wall with a sharp focus for texts as well as graphics. Flexible and reliable, Delta’s video wall helps the system to operate 24 hours continuously, supporting train services and maintenance activities remarkably. BMRCL has chosen Delta for being a global market leader in providing video wall solutions in the railway industry. Any failure in power grid can be acted upon in real time with Delta’s displays. BMRCL managed to further optimize and centralize the work procedures. The safety of the metro passengers has also been enhanced. The Bangalore Metro, known as “Namma Metro”, has uninterrupted power supply, facilitating the regular arrival and departure of trains along the route. The provision of power at all stations and trains of the Bangalore Metro Rail Corporation is monitored on Delta’s video walls at the Operations Control Centre. The OCC is responsible for command and control of the whole power system including the stations and trains. Every day, the operators of the Operations Control Centre of BMRCL ensure the safety of millions of passengers by constantly monitoring train speed, signals, station activities and power supply. Display technology from Delta provides them with a perfect overview of the entire power system operation.